Diary entries which mention Willie Whittaker, a friend of Arthur Linfoot from South Durham Street Chapel. 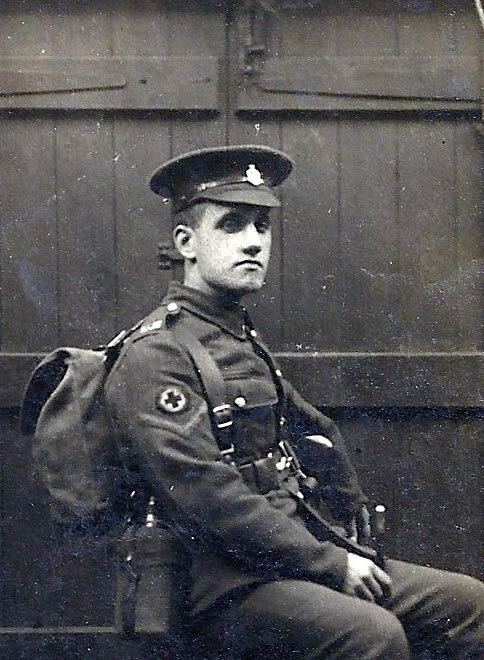 Willie Whittaker enlisted in the 13th Battalion of the Yorkshire regiment in November 1915, rising to the rank of Second Lieutenant (by then serving with the Northumberland Fusiliers) by the time of his death, which is recorded in October 1917. Image and text via the British Newspaper Archive. WHITTAKER – – Killed in action October 22nd1, 1917 aged 22 years, 2nd-Lieut, William Gaylard Whittaker2, Northumberland Fusiliers, dearly loved son of William and Agnes Whittaker. Up at 7 o’clock. Still standing by and no church service. Rumours of Germans’ retreat up the line. Wrote to Willie Whittaker. Fine morning. Service in the field in the afternoon but it rained and so we stopped before the sermon. Rained a bit at night. Wrote letter home in reply to one received and also to Willie Whittaker and Franchie Inwood. Went to bed early at night. Lay awake with toothache, but generally slept well. 1 killed and 9 wounded of the 57 Ambulance at La Boisselle. Went out with Mother in the morning. Visited Granny and Whittakers and Uncle George and Aunt Mary. Stayed in and played duets all the afternoon. Left by the 6.38. All family to see me off, and Willie Whittaker, Uncle Jack and Hilda1 and Whittaker family. Joe travelled with me to Pallion. Met Shepherd at Durham and travelled by a through train. Got car into city and arrived at barracks about mid night. Visited Grandmother, Whittakers’1 and Jack’s. Mr Dill’s funeral in the afternoon and I went over to see it with Ernie. Met George Crawford2 who was in the procession. Climbed Ernie’s backyard wall to get in. Ernie took my photo3. Down to chapel at night and saw Mr Blott, Arthur Mullens, Billy and Edie and a few more. Photograph of ALL in uniform, with lance-corporal’s stripe, seated in a back yard; undated, but possibly taken while on embarkation leave, April 1916. 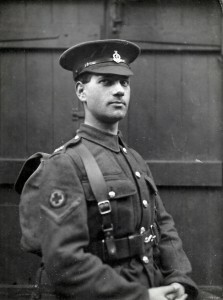 Photograph of Ernie, ALL’s elder brother, apparently wearing ALL’s uniform and seated in the same back yard, possibly taken on the same day. Lay in late. Went down to see Ernie. Out with Mother and over the water1 to see the damage done by the Zeppelin raid2. Out late in afternoon. Called at Whittakers3. Called for Ernie at night. Went over with him to Whitburn later. Had photo taken at Eccles’† in Holmeside4.